A few days ago my family and I shopped at Costco. Among the things we brought home for our own use included: rolls of toilet paper that would be several months’ supply, big bottles of ketchup that will last us a year, gallons of cooking oil enough to fill a small bathtub, cartons of toothpaste adequate for the use of a whole men’s dormitory (provided they brush their teeth), and bottles of shampoos plenty enough for a small hair saloon. Popular now here in US, or perhaps in some other parts of the world as well, is wholesale or bulk buying. Stores like Costco, Sam’s Club and other warehouse-like stores caters to this practice and offer bargain sales of their products. I don’t know why we like to hoard so much stuff. Do we really save money if we buy things on bargain, but don’t really need them? When I look at our pantry and our garage where we store all the items we bought, I am struck by the realization that we would rival the stocks of a small sari-sari store in the Philippines. My mind flashed back to our “suking tindahan” (favorite store) of my neighborhood in Sampaloc, Manila. Sari-sari store is unique to our culture and as Filipino as the jeepney. It is a result of our entrepreneurial ingenuity. It accommodates to the concept of able to buy “tingi” (units), instead of the whole package, so we get just what we need. When I was a child, my mother sent me many times to the corner store. Empty bottle in hand, I had to buy 20 centavos worth of vinegar, or 50 centavos worth of cooking oil. Sometimes I was asked to buy two or three sachets of shampoo and a small tube of toothpaste. That store has everything a kid needed, too — from plastic balloon, marbles, Bazooka bubble gum, Choc-nut, to Mongol pencils, pad paper, cartolina and papel de hapon for my art project. I remember that I could even buy 10 pieces (or even fewer) of lined paper, without the need to buy the whole pad. Or I can buy 3 or 4 pieces of coupon bond paper (I used to call it cocomban), just what I need for that day in school. Recently here in Iowa, I needed Manila envelope, and I had to buy a whole, big box of it at a warehouse store. I got what would be a lifetime’s supply. I pondered: Did I really need all these? Maybe I can barter it for some pan de sals. Ah, the pan de sal. In Sampaloc, we used to have a favorite bakery at the corner of the next street. On many mornings, I was sent there to buy P1.50 worth of pan de sal that was enough breakfast for our family of 5. (Maybe I’m showing my age with these reminiscences.) 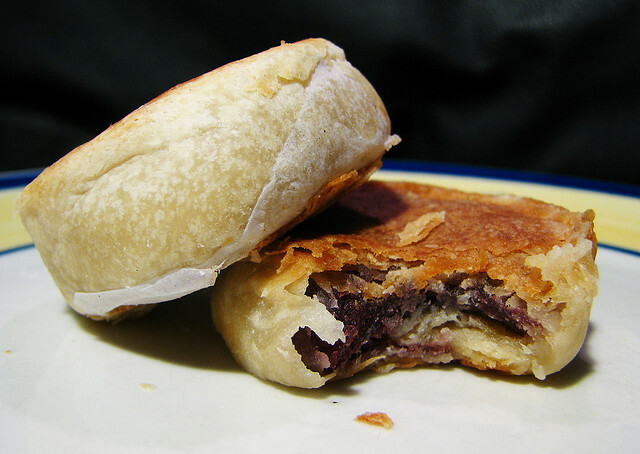 The still hot buns were placed inside a small brown paper sack, and during cold mornings, I will put them close to my chest to keep me warm, while the sweet aroma of newly baked bread filled my soul as I walked back home. That aroma, to me, is one of the most glorious memories up to this day. There is packaged pan de sal in our Asian store in our locale here in the US. But they are not freshly baked; worse, sometimes they are even frozen. The bread most similar to pan de sal available in Costco is like a dinner roll. But it comes in a package as big as Santa’s sack, enough to feed a small platoon of soldiers. I heat them in the oven. With lots of imagination, I can convince myself that they taste like pan de sal. Before Facebook, sari-sari stores in the Philippines are the real networking sites. The front of the stores are favorite hangouts for people in the community, where they exchange stories, gossips, news, and opinions, over a bottle of beer or a game of checkers. Most of the time, people just stayed there and watch the world go by. Sometimes, there will be heated arguments and fights in front of the store, especially when these “tambays” had too much to drink. Such were the perils that went with owning such a store. 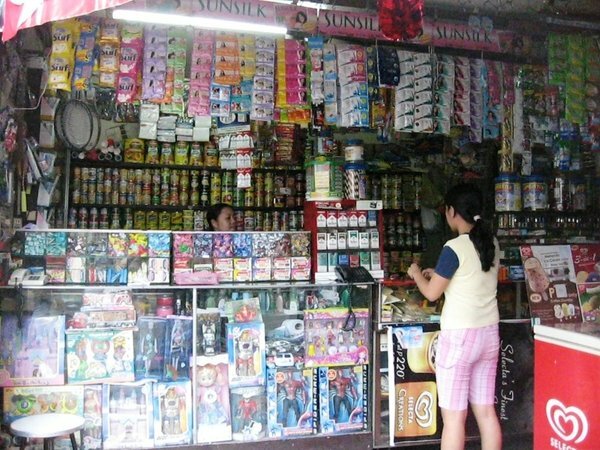 One of our barkada’s favorite hangout was a sari-sari store in front of our church in Galas, Quezon city. There was a basketball half-court in front of our church, and after hours of playing, we trekked across the street to Aling Luring’s store. Here, we got our refreshments, sometimes with our shirts off, and spent time there just relaxing. My usual order was Sarsi and hopia. Sometimes we even did not have enough money to pay, and we would just ask Aling Luring if we could pay it next week. Since she knows us (and our parents), most of the time she let us. About a year ago, after many years of living abroad, I went back home to the Philippines. I attended my childhood home church and saw familiar faces and some new faces. The basketball court was still there. The residential houses around the church had been replaced with commercial buildings. I looked for the familiar store across the street, but it was no longer there. In its site was a new business building. Not far in the area was a large supermarket. Alas, Aling Luring’s store became a victim of progress. It was devoured by the same commercialism it represented. I was sad; the place that had formed part of my passage through teen years was gone. I would have liked to get Sarsi and hopia for me and my friends, for old time’s sake. As we ended up going to a nearby Chowking outlet, we consoled ourselves — at least we still had the memories. Ay, bigla ko tuloy na-miss ang sarsi 🙂 At mahilig din ako sa Hopia… yung munggo! Ang galing naman at napublish pala ito sa Manila Standard Today. More than 2 years na ang huling uwi namin. I just got those pics from the internet, but I failed to give the proper credits. 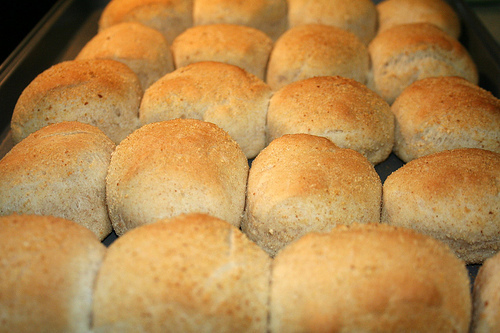 The pandesal and the hopia looks so good, I can almost bite them.